Hellraid has an absolutely awful name. Abysmal. It's the type of generic schlock you immediately forget as soon as you hear it. But a rose by any other name would smell as sweet, and Hellraid is—despite its tragic moniker—actually a bit of an unexpected rose for me at E3. 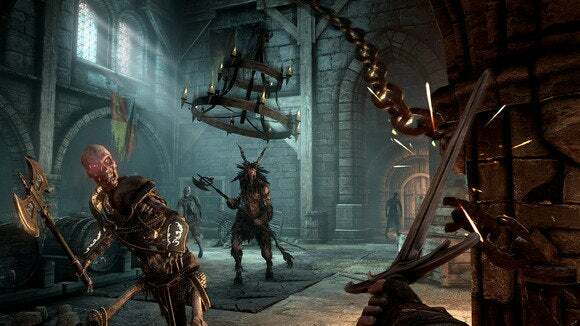 Hellraid resembles nothing more than a weightier version of Skyrim's combat, based on the extensive hands-off demo I previewed at E3. It's a first-person game that's heavily reliant on medieval-era combat. 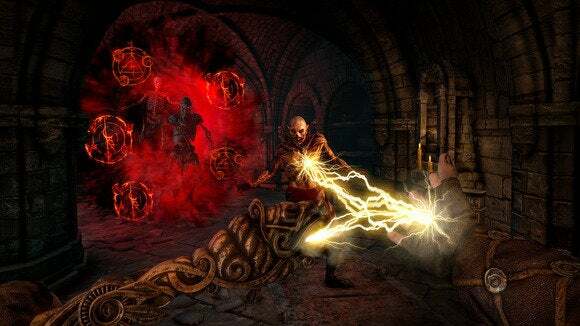 Swords, hammers, halberds—you'll wield them all in Hellraid, as well as a hefty number of magical items. We saw, for instance, a staff that doubled as a flamethrower and another that shot lightning towards foes. I honestly feel like the combat is most of what I can talk about with Hellraid, because I saw so little else. In our half-hour demo we simply delved deeper and deeper into a ruined gothic cathedral in search of its keeper, a monk gone mad. While that's certainly an interesting premise, it's also a premise that's been done to death a billion times. Spooky cathedral? Insane monk? Skeletons? Oh boy, it's a trifecta of game tropes almost as generic as the name Hellraid! What's worse is I don't know what the rest of the game looks like outside this level. I don't know whether it's an open-world game like Skyrim or whether it's a series of linear levels like what we saw Tuesday. For all I know, this was the only level in the game. That last scenario is particularly doubtful, but who knows? As of the time I'm writing this article, the plot section on Wikipedia (the most trusted of sources) literally reads, "A select few must battle the armies of hell. The player can do this with both melee and magic." 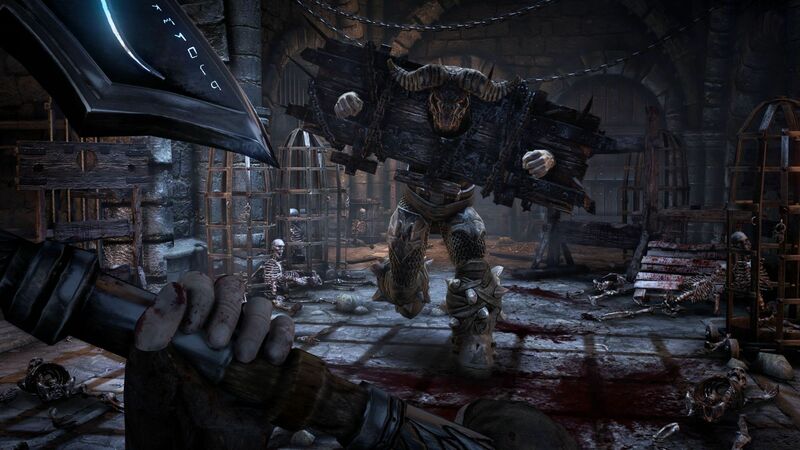 But there's something about Hellraid's combat that's intriguing—a kernel that could explode into a full-fledged piece of popcorn given the right care and treatment. Let's face it: We're all used to great games saddled with dumb stories, and if Hellraid turns out to be one of those, well, I can hardly say I'm surprised. What I saw, however, looked fun and fluid. We sliced through skeleton after skeleton, plodding ever closer to our objective. 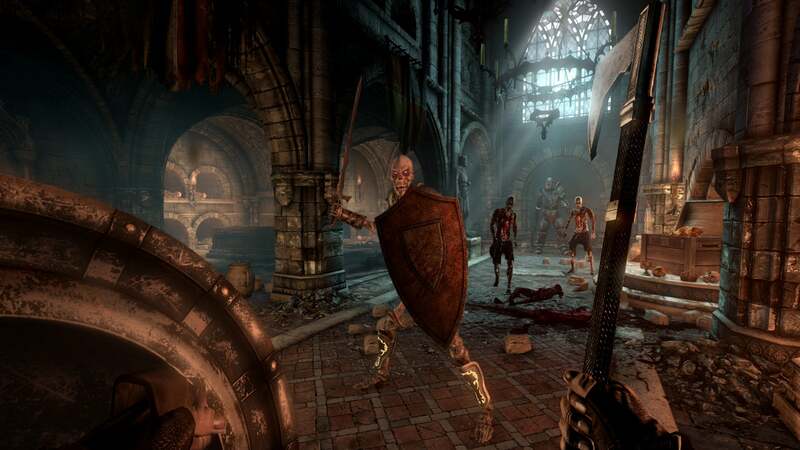 Combat does look, as I said, like a weighty version of what's found in Skyrim, or—maybe more apt—like a medieval version of developer Techland's other game, Dead Island. Swords can make quick, flashy work of your enemies while hammers will literally crush them to the ground. It's all handled with a heft I always felt was lacking in the Elder Scrolls games. Even in Skyrim, it felt like your sword was a floating pool noodle. Enemies are a bit dumb for my tastes, tending to run directly at you and swing for the fences, but I'd also be willing to believe this was because we fought skeletons—I assume the brain dries up when it's not encased by skin anymore, eliminating any knowledge of advance tactics. The most interesting part of the demo came at the very end, when we fought a massive paladin named "Blinded" because he had a helmet pulled down and nailed over his eyes. While particularly gruesome, the developers informed us it was because he'd betrayed his king while alive, and this was his punishment. I'd love to think Hellraid will integrate some creatures that follow a Dante's Inferno-style "punishment fits the crime" design philosophy, but I was left wondering how Blinded's backstory would be conveyed to the player. We fought Blinded. We killed Blinded. At no point did the demo pause to relay the story behind Blinded's plight. It's a shame, because that was the most interesting story tidbit in the demo and I have absolutely no idea what form it will manifest in the game. I'm surprised, though. After reading the name, I was ready to write this one off. Maybe that snap judgment was premature. We'll be able to test for ourselves soon—the game is scheduled for an early access testing phase this fall, with a tentative launch date of next spring for PC, Xbox One, and PS4.